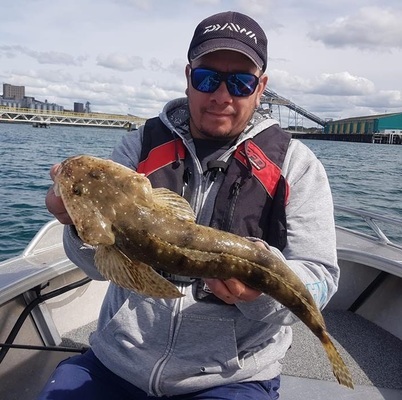 FLAT OUT: Paul Mayer with a flathead caught in Corio Bay's inner-harbour. The past week produced some good fishing throughout Corio Bay. In particular, flathead were caught in numbers – and with some good sized models among them, too. Paul Mayer fished the weekend’s calm conditions, managing a dozen or so flatties while casting so plastics around the bay’s inner-harbour. I fished the same area, catching a sizeable rock flathead among a mixed bag of fish. The flatty took a soft plastic cast into shallow water. Bream, trevally and pinkies can also be expected around the inner-harbour at this time of year, along with the odd snapper. Whiting finally made a much-anticipated return to the St Leonards area, with some anglers able to bag out. Excellent squid fishing continued from Clifton Springs to Queenscliff, with the deeper water off the latter and Point Lonsdale producing big specimens on jigs baited with silver whiting. Size 3.5 artificial jigs rigged with an assist weight to get them down a bit quicker in the tide also worked well. Fez Sepic fished offshore Barwon Heads for gummy shark over the weekend, dropping a fresh salmon fillet down to the bottom. His line soon took off at an unexpectedly fast pace before a mako shark estimated at 100kg-plus jumped and bit through Fez’s line mid-air. Great salmon fishing continued along the Surf Coast, with beaches like Hut Gully and Moggs Creek right down to Apollo Bay producing the goods. Low swells also made fishing the rocks around Lorne easier to fish for salmon. Freshwater angling was fantastic around western Victoria, with the Hopkins River fishing very well for big brown trout. Casting Rapala f7 and f9 lures under the falls and into any small pools around the area produced browns pushing 6lb. The Glenelg River at Nelson made the report again this week after anglers caught mulloway and bream on fishing baits like pilchard and squid. Upstream waters around Donovan’s and Dry Creek sound like worth visiting, with the bream responding well to pilchard chunks and worms.